This boho style necklace is made using Origami paper. 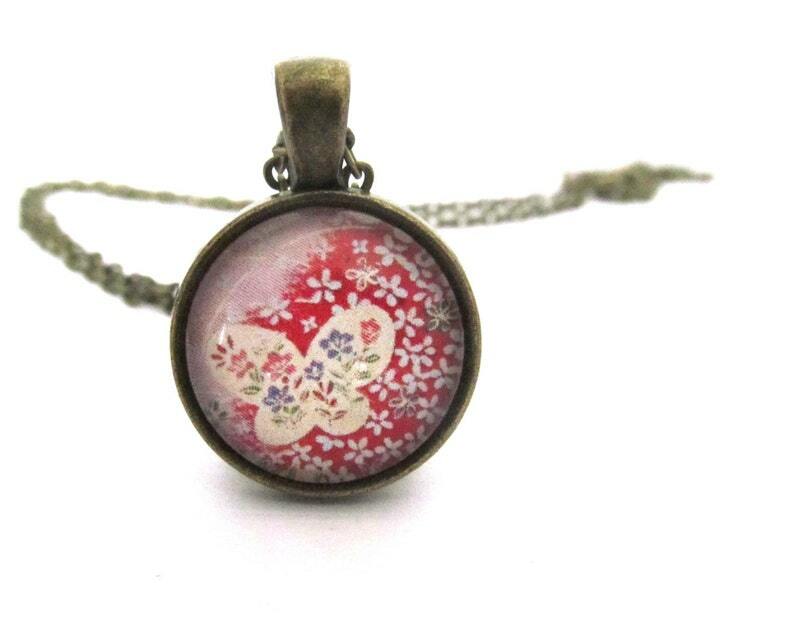 The print is of a white silhouette of a butterfly on a flower specked red background. The paper is protected with a layer of resin and clear domed glass. It is set in a bronze setting measuring 20mm in diameter (check out the final photo for a size comparison). The included necklace is 24" in length but can be shortened at your request. A great birthday gift! Origami is the japanese art of folding paper. Any paper can be used, but traditionally, origami is performed with paper made using a block print process. Various forms of Origami paper are available, including Chiyogami and Washi. All necklaces come in a pretty organza bag, ready for gift giving (or to keep). Please do not wear while bathing, swimming, etc. All chains and settings are nickel free. Butterfly Necklace Made with Origami Paper, Green and Blue Butterfly Pendant. Pretty Gift for Her, Summer Jewelry. 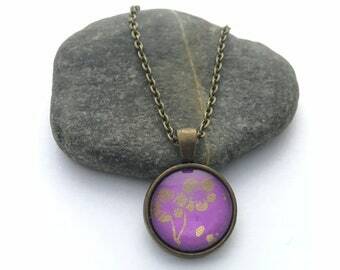 Handmade Glass Pendant.